Jonathan always thought he was “special”. He was the kind of kid who would put his leg over his head at the family reunion or perform musical armpit farts to impress the girls. In 2004, contorting his body and impressing people with his unusual talents became his full-time job. Since then he has performed at over 200 colleges & universities, at festivals across the US, Canada, China, Ireland, and New Zealand, and was recently featured on the Jay Leno Show. 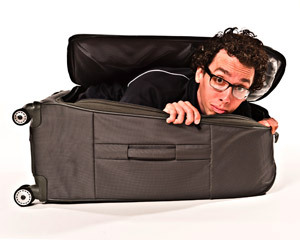 Evan Young is an internationally touring comedy juggler who specializes in outdoor venues, but is also known to tackle indoor stages. Punctuated by fun circus style stunts and juggling tricks, his humor surprises and engages audiences of all types. The joy of the circus comes to life at your next event when this duo comes barreling through the door! Cissy and The Man will delight their audience with humor, joy and skill. Their show offers a message of love to which everyone can relate. 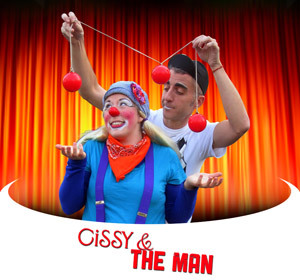 With 20 years combined experience, Cissy and The Man use juggling, clowning, dancing and other silly antics to keep their viewers smiling and wanting more. Let them help celebrate your next school assembly, festival, parade or birthday party. Available together or individually. Forrest has a wide variety of talents. 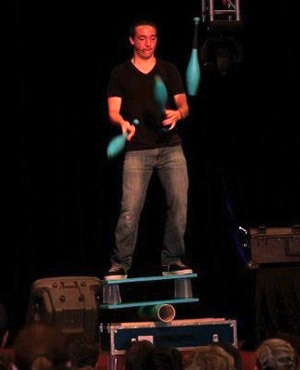 Beyond juggling balls, clubs, rings, and torches; Forrest’s show also includes balancing apparatuses such as unicycling and balance boarding. With an emphasis in humor as well as outstanding tricks, Forrest’s show is entertaining for all ages.